I have been contemplating my navel, well metaphorically anyway, wondering what it is about sewing that can keep me awake until the wee small hours.Then it came to me…LOVE. I sew because I love it.I love the first seed of an idea…be it searching for a pattern or creating a design from scratch.I love to watch that idea grow and bloom. The sense of satisfaction from completing an item ,whether a small gift or a 70 inch square quilt, is amazing. Even better than this feeling though is when I gift the item to someone special and they LOVE it ! If you are a sewist, you know what I am talking about ! My latest project was born from my frustration at the selection of nightwear when searching for some PJs for my 4 yr old…not to mention the ridiculous price. Everything was polyester, not a scerrick of cotton in sight ! Off I trotted to the nearby Spotlight shop , purchased 2 meters of cotton voile -total cost= $8. Four hours later ( sounds a long time but I am a newbie to garment sewing ) and I had a shirred night dress and an appliqued PJ set. To top it off-they fit and Missy Moo loved them ! 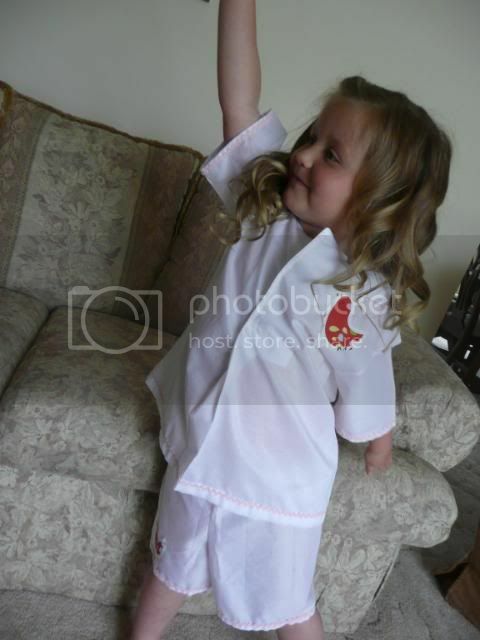 No pic of the nightdress yet ! 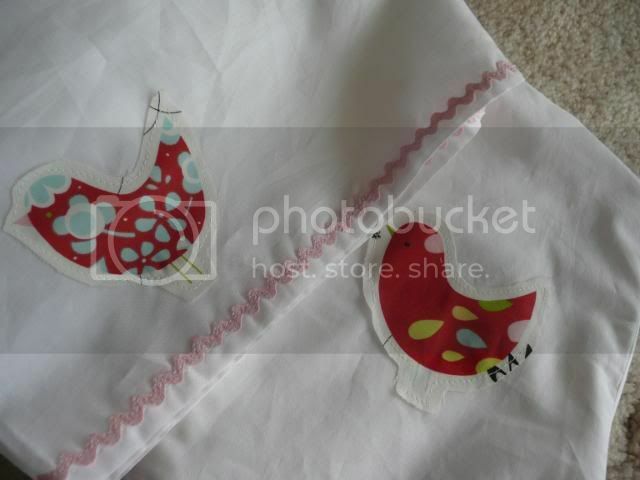 The applique was without Viesofix as I wanted it to remain soft. The edges will fray over time but that is the effect I am wanting. Oh, and I made use of my stash of vintage sewing paraphenalia from my grandmother which provided the pink cotton ric-rac. A fab, cheap project that was useful and cute! In case you were wondering, I used Simplicity pattern number 8493. 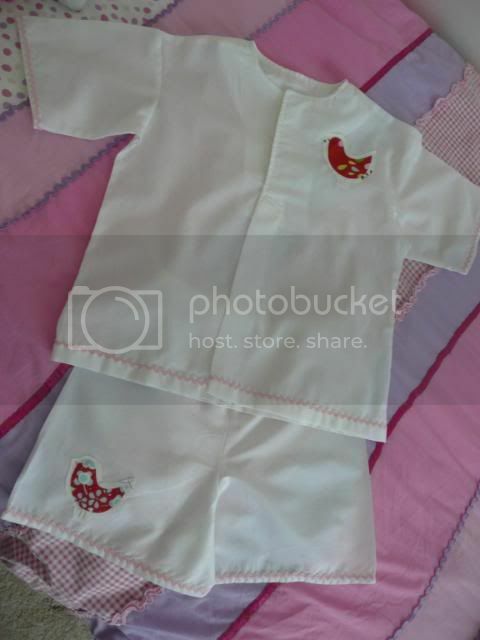 A great unnisex design that has long sleeve and pants option plus a robe and a zip-up all in one style for the toddlers. Thanks for visiting my blog, Butterfly Chirp. I appreciate your comments! Great job ! The shop ones are all polyester or something else that can't breath , love your fabric . I think four hours is pretty good going. What with cutting out and applique, then allowing for all the things that go wrong (or is that only me)and, of course, the coffee breaks. And won't they be comfy to wear. Oh I know what you mean about sewing. For me it is the buzz of the "finished product"- sometimes I don't enjoy the sewing itself, but I love finishing something. Needless to say I do a lot of "quick fix craft"! PS Nice PJs! I think 4 hours is pretty speedy! What a great pattern with all those options. I am making my kids PJs this summer too.